Stray Kids's 'Uniformz' explain Hyunjin's nickname 'SOPA Prince' + share 'Confession Day' memories in 'Stanning Guide' Part 2! Part 2 of Stray Kids 'Uniformz' line's special interview with Xsports News is here! Stray Kids's Uniformz is made up of Hyunjin (2000), Seungmin (2000), and I.N (2001). 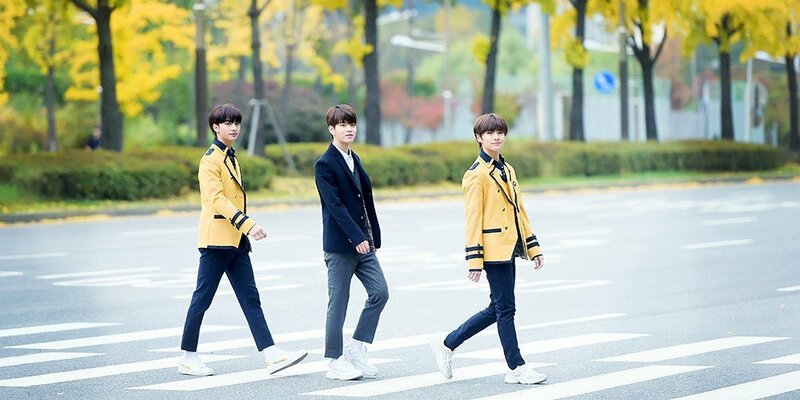 Hyunjin and I.N attend Seoul School of Performing Arts, while Seungmin attends Chungdam High School. Both Hyunjin and Seungmin will be graduating high school early next year. Check out Uniformz's interview Part 2 below to find out what the story behind Hyunjin's nickname "SOPA Prince" is, the members' 'Confession Day' stories from their school days, and more! Q: Were you guys popular with the girls in school? I.N: "In elementary school, I was on the chubby side so I wasn't popular, and I went to an all-boys middle school. The school that I attend now is full of other celebrities (Laughter)." Hyunjin: "There are top stars who are much bigger than us. We have no presence there... (Laughter)." Q: Hyunjin has a nickname "SOPA Prince"? I.N: "(Grinning mischievously) Yup, he's the prince!" Hyunjin: "I need to explain this clearly. The kids in my class are asking me 'Why are you a prince?'. They've never called me that before! (I.N repeats his above statement.) I think it's only the kids in I.N's class who call me that. No one in my year calls me that. I am not the 'SOPA Prince'. Please make this known!" Seungmin: "I am attending the same school that I went to since before my debut... Before I debuted, I would go out and roam the streets with my friends during lunch time. After debuting, I stay inside the classroom during lunch, and we never go outside, just talking inside (Laughter). I don't have as many opportunities to talk to my friends in class. I try to ask them how they're doing and what kids these days do..."
I.N: "I don't think so ever... Oh, there was one time in middle school when I got a letter from someone who went to a different school!" Hyunjin: "Me as well, the hoobaes just..."
Seungmin: "I've gotten exactly one letter from a hoobae. I remember it because it was only once (Laughter)." Q: What do you want to do when you turn 20? Seungmin: "I want to stay a student. I don't want to become an adult (Laughter). If I had to pick, I want to have access to use smartphone pay for small purchases. Right now, I need my mother's permission. I do want to do it on my own. I want to be able to easily send the members gift-emoticons." Hyunjin: "I think I will live the same life even when I become of age. I've made a card for smartphone small purchase pay, but I don't have anywhere to use it on. Oh, I do want to have a party with the members." I.N: "Right now, I can only use emoticons that others sent me as gifts. So [when I get a smartphone pay card], I'm gonna buy a ton of emoticons. Like, a ton." For more exclusive Xsports News photos of 'Uniformz' line Hyunjin, Seungmin, and I.N, go to their 'Stanning Guide' interview Part 2 here!